Who is talking about income inequality? Just about everyone. President Obama is talking about it. Senator Ted Cruz is talking about it. We talk about it. Even William Shakespeare had a say in the 17th century. A recent report from the Centers for Disease Control and Prevention now shows that income inequality is affecting those who CAN'T talk about it. Infants. The United States, compared to other developed countries, is almost dead last for infant mortality falling behind Cuba, Slovakia, and Bosnia and Herzegovina. Statewide, disparities are even more alarming. Alabama, with a rate of 8.7 deaths per 1,000 births, falls behind Lebanon and Puerto Rico. The United States has 6.2 deaths per 1,000 births while the best-performing country, Monaco, is at 1.8 deaths. 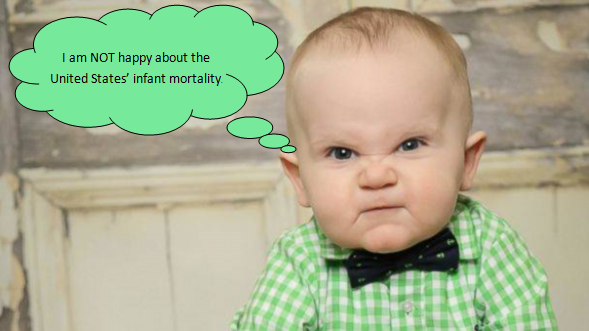 While there may be some discrepancies country to country in the definition of "infant mortality", new research says these differences do not account for our poor performance in comparison to our peers. The recent paper also states our poor mortality rates are due "entirely, or almost entirely, to high mortality among less advantaged groups". Income inequality is leading to infant survival inequality. While wealthier Americans see similar mortality rates as the better-off Fins and Austrians, it is our poor falling behind. In the other developed countries, low infant mortality is consistent across the classes. In a not-so-surprising conclusion, it is better to be rich in the good ole U.S. of A.